Finland's postal service will be doing more than just delivering letters and parcels this summer - its workers will be mowing lawns, too. 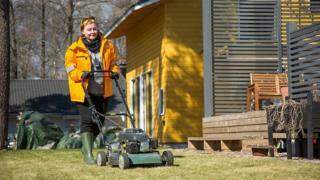 The state-owned Posti company is offering a weekly grass cutting service, with customers able to choose either 30 minutes or 60 minutes of lawn-mowing time, the national broadcaster Yle reports. It will only be available on Tuesdays, though, as the volume of post tends to be lighter than on other days, and customers will have to provide their own lawnmower. They'll also have to be willing to pay 65 euro (£51; $73) a month for the half-hour sessions. Posti has been looking for ways to tackle a falling demand for its mail services in recent years. Earlier this month it announced that delivery times would be extended into the evenings when people are usually at home. According to Anu Punola, a manager at the company, venturing into the world of gardening was a grassroots idea which came from postal workers themselves. "We have genuinely tried to find services that would make people's lives easier," she says, adding that staff have volunteered to take part in the initiative. It will be available nationwide between May and August. At least one organisation isn't happy about the plan, though. The Real Estate Employers group, which represents property maintenance companies, says it's concerned that postal workers don't have the right skills. "Using power-driven machinery and equipment requires a certain expertise," says managing director Pia Gramen. "It is hard to believe that just anyone can start to cut lawns."